Jumping down to the next branch with the rope, he landed lightly even though it was every bit of a 30 foot drop. A gleeful shout to his left came from his best friend, who had also jumped. He quickly tied the complicated knot around the gnarled limb and shimmied up the rope to where he started. Moving the tents were always a job for the young. They were lithe and fast, like little spiders running their webs. Another rope, another jump, and the dwelling was nearly done. The two boys giggled and raced up the ropes again, always making a game from their daily chores. Requires Massive Tree Construction Set. 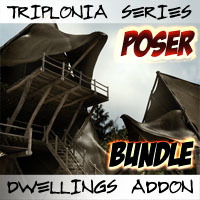 From the World of Sen by Erogenesis, Dwellings construction set for Daz Studio.